Published: January 4, 2011Gerry Rafferty, a Scottish singer and songwriter who combined a gift for melody, a distinctive voice and a fatalistic worldview to produce 1970s hits like “Stuck in the Middle With You” and “Baker Street,” died Tuesday in Dorset, England. He was 63. 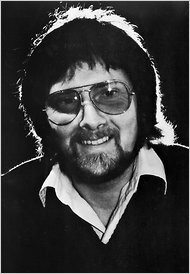 Gerry Rafferty in the 1970s. In all, Mr. Rafferty sold more than 10 million albums over three decades. A version of this article appeared in print on January 5, 2011, on page A20 of the New York edition. "Clowns to the left of me, jokers to the right. Here I am, stuck in the middle with you." I still love that song. R.I.P. Gerry. Baker Street is one of my favorite songs. Such a unique voice. I'd post the Youtube clip from Reservoir Dogs with "Stuck In The Middle" but it's a bit gruesome and probably against the rules. Very cool though. Michael Madsen is hot. I knew I should be disturbed or something but I was cheering him on. Mr Blonde was pure hotness. Damn. $125k a year for royalties on one song? Not a bad gig, but not good if it allows you enough money to drink yourself to death.